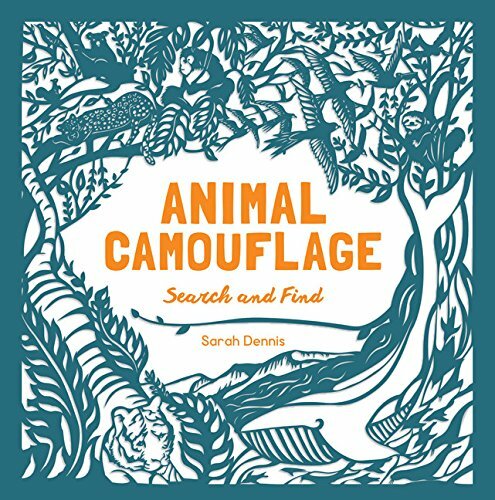 Paper artist Dennis (Papercut Wilderness, 2017) and children’s activity book writer Hutchinson (Neon Nature Colouring & Sticker Activity Book, 2016), both based in England, make a solid pairing for Animal Camouflage, a beautiful blend of facts and interactive fun. Beginning with a straightforward invitation, “Welcome to an animal adventure that will take you all around the world,” readers will jump right into Africa, the first of the seven standard continents identified on the opening page. As explicit, appropriate and tone setting as the contents page may be, a stylistically consistent world map would have made a wonderful addition at this point for readers to establish their global bearings. In any case, Africa sets the pace for the remaining sections. General information about the topography, countries, and variety of the African region is followed by more specific animal trivia. Each animal is treated with a silhouette cutout and a fact or two. The lithe gazelle, for instance, not only runs super fast over long distances but jumps (also called pronking or stotting) from side to side as it runs in order to confuse predators. Readers then turn the page and become searchers or finders as they survey the scene set out before them: a stunningly intricate African landscape. Woven deftly among trees, shrubs, watering holes, and each other, the animals are indeed camouflaged and require concentrated optical determination to spot; not nearly as mind numbing and dizzy as the Magic Eye 3D images from the 1990s but definitely requiring some focused dexterity of the visual cortex. Alternating between fact pages and searching pages, most of the animals are already well known by this targeted six- to nine-year-old age group, with few exceptions. Africa brings up elephants, cheetahs, lions, hippos, rhinos, etc. Asia delivers tigers, pandas, camels, Komodo dragons, etc. Europe draws upon foxes, rabbits, bears, cows, etc. Only in Australia do we meet the potential unfamiliar quokkas, echidnas, kookaburras, and dingos. One suspects that the animals’ statistics, beyond which the first through fourth graders will most likely have progressed, are not what this book is all about. Rather, the main appeal is the hunt for them within their quite unique settings. Providing a bit more depth to the hunt are challenge questions, tasks a slight bit more age appropriate, that apply to the search and find in each continent. Such questions as “How many billed creatures are there?” will tempt the reader to deface the artwork with a pen as they try to keep track. This reader was able to uncover 27 billed creatures on the Australasia page when in this case the answer guide informed of 61. Those darn evasive echidnas and kookaburras!! Overall, there is a pleasant visual balance in the complexity of the illustrations and a sense of relief at the simplicity of the factual information. Animal Camouflage is a distinctive artistic addition to any animal lover’s library.